Shearer and Teplin joined staff writer Jura Koncius recently for The Washington Post’s Home Front online chat. Here is an edited excerpt. Q: We do not have a play room, so most of our toddler’s toys are kept on the first floor and are visible as soon as you walk into our house. The first floor is open, so there aren’t many places to hide them. We use a storage ottoman for most of his toys, but how should we organize his little kitchen and trucks? A: For this situation, we would always recommend possibly getting a small furniture piece with closed storage, even from Ikea. It’s always so fun and cute to set up a “parking garage” for larger vehicles inside a cabinet as well. Q: What’s the best way to organize a new house when you have a lot of stuff? A: Edit first. Make sure everything you are bringing into a new house is what you want. Q: I’m looking for a clever and convenient way to organize my jewelry. Any suggestions? A: Use vintage tea cups for necklaces or rings. They can be a beautiful counter display. Q: What are your suggestions for organizing board games? The boxes they come in are always breaking and of varying sizes. A: We love to unbox a game. Use shoe boxes from the Container Store, with Smart Store cups inside to contain any small pieces. For larger boards that won’t fit into a shoe box, use an acrylic magazine sorter to stand the board up on a shelf. Turntables with dividers are also great for holding small game pieces in one area. Q: I have a completely open kitchen and small pantry to store all food, dry goods, sauces, coffee, etc. It is impractical to keep beautiful quantities of the same item due to the lack of space. Do you have suggestions for making foods that are different sizes and colors look good together? I am having a baby in a month, so any tips that are sustainable and easy are greatly appreciated. A: Use the same type of bin to store the food and it will look beautiful despite the food not being the same. Q: How do you encourage your kids, partners and helpers to keep up the systems and organization? A: We truly believe that if there is a system in place with labels, it is easier for other family members to know exactly where to put items back. Keep the system simple, with general categories. Q: I am a single mom of two girls, living in a New York City apartment. My daughters are 4 years and 3 months. How do I preserve hand-me-down toys for my younger daughter while keeping my older daughter’s toys current and clutter-free? A: Clear storage boxes meant for shoes or boots, which can be easily stacked and placed under beds. Q: Do you recommend dressers to store clothing? What would you look for in a dresser? A: If you need the additional storage, then a dresser is always a great option. We love any drawer that is more than 12 inches deep because it gives you more choices of product to use inside a drawer. Q: I just moved into a new apartment, but it has no linen closet. I’ve crammed my linens into an armoire from Ikea, but is it worth installing shelving in a closet for them or somehow building a linen closet? A: If it’s possible to just place a free-standing shelf unit in the closet, that may help instead of installing one. You can use baskets to store linens and towels. Q: My husband and I are in a two-bedroom condo, and we’ve fallen in love with Lego building sets. We have a neighborhood block of Lego buildings on our dining room table, he has multiple spaceships at work, and I have some major architectural models in my office. How do we display these? I’ve got artwork on most of my walls at home, so there’s not a lot of space for items with a 12-by-12-inch footprint. A: A floating or narrow leaning shelf would be best. We also love using small acrylic risers to display smaller Lego models. Q: I have a small but not cramped house with a nice attic storage space, which I just cleaned out. How should I best inventory and store things so I can rotate them in and out of use, either as décor or for their function (like glassware)? Rather than make hard choices, I’d like to swap things out every now and then to keep things fresh and in use. A: Use clear bins to store items and create labels. Q: How many books should you keep? If they are in boxes in the attic, should you get rid of them? A: Open the boxes. Really see what’s inside and do an edit to keep what you love. Display them, use them and get rid of the rest. Q: The area under the kitchen sink is yucky-looking no matter what I do. Any ideas for how to arrange all those products? 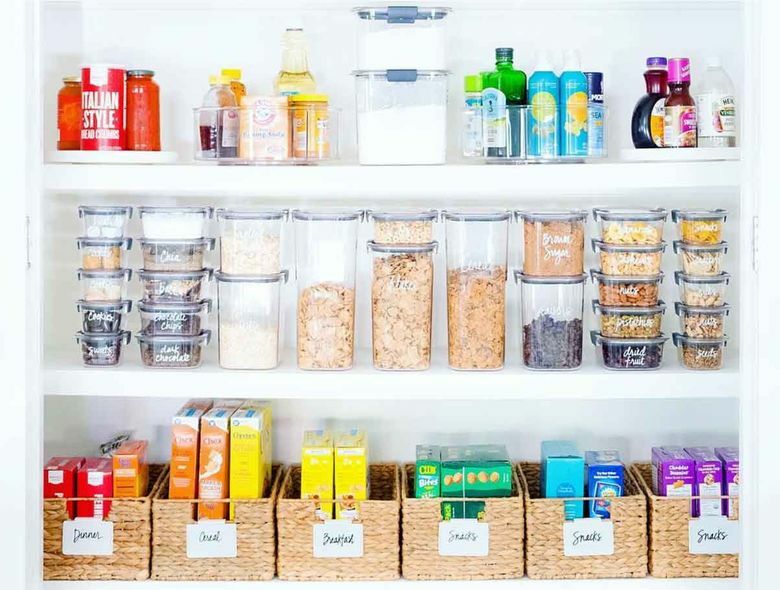 A: Using InterDesign Deep Pantry Binz in this area with Smart Store cups (both from the Container Store) inside the bins is a great way to keep this area looking clean. We also love to “unpackage” as many items as we can, meaning taking trash bags out of the boxes and placing them in the pantry bin, and dumping dish soap pods into a Smart Store cup (as long as you don’t have small children who may want to play with these). Q: What is the most complicated item to organize? A: Beads — you have to sort by color, type and size, and everything is the size of quinoa.